The star ingredient here isn’t the chicken or the vegetables, but a warm, bright, red pepper paste from North Africa that is both hot and smoky called harissa. Harissa is a red-colored paste blended from chilies, spices, garlic, and olive oil. Nearly every family in its region of origin has its own formula. Think of harissa as a cross between your favorite hot sauce (especially if that hot sauce is sriracha) and ketchup (if ketchup were made with peppers instead of tomatoes). A little goes a long way, so I like to stir olive oil and a little cumin and coriander into harissa to stretch it. In this sheet-pan of chicken, carrots, and cauliflower, I put dabs of the harissa on everything; it mixes with the cooking juices to make the dish warm and mildly hot. You can buy harissa in a tube or jar, and they’re all different. It can be lipstick red or so dark that it’s almost burgundy. It also comes in powdered form, and in that case, follow the label instructions to rehydrate. Look for it in the condiment aisle of a store that carries a lot of specialty ingredients, such as Whole Foods, or order it online. Buy chicken pieces on the bone for this recipe—whole legs, thighs, or bone-in breasts. They work best because they need to cook longer than boned (which helps everything finish cooking at the same time), and their juices baste the vegetables as they cook. Before you cook the chicken, rub it with a little of the harissa sauce and let it sit in the fridge for as long as you have. An hour is okay, but the longer, the better—up to 12 hours. Let carrots, cauliflower, sweet onion, and lemon slices get a head start in the hot oven, covered in foil, for about 20 minutes until they’re nearly softened. Then uncover and give them another 15 minutes or so. Finally, add the chicken and continue cooking 30 minutes more. This seems like a lot of time for roasting vegetables, I understand! But by the end of cooking, these slow-cooked vegetables have become incredibly juicy and charred in spots. The lemon and onions become very soft, so their sweet and tart flavors mingle in the dish, and the chicken skin is crisp with a pleasing heat. There is no way to shorten the vegetable roasting time, but you can make them a day ahead, refrigerate, and let the pan come to room temperature before adding the chicken and finishing the recipe. To prepare the dish partially in advance, cook the vegetables with the foil, and then with the foil off (through step 4). Cool, cover with the foil, and refrigerate. Before serving, remove the foil and let the vegetables come to room temperature. Then add the chicken and finish roasting. MORE SHEET PAN RECIPES TO TRY! If you can only find the powdered harissa, add 1/4 teaspoon each of salt and ground coriander (skip the salt if your blend already includes salt) and then reconstitute using 2 tablespoons of harissa powder and 2 tablespoons of olive oil. 1 Make the marinade: In a bowl, stir the harissa paste with 2 tablespoons of the olive oil, coriander, and cumin. The mixture should form a paste that just drops off the spoon. Stir in the remaining olive oil, if needed, a little at a time. 2 Marinate the chicken: If using thighs or legs, trim the excess skin and fat; transfer the thighs or legs or breasts to a bowl. Add half the harissa mixture and turn the chicken until it is thinly coated all over. Cover and refrigerate for at least 1 hour, or for up to 12 hours. Refrigerate the remaining marinade separately until needed. 3 Prep the vegetables: Remove the green leaves from the cauliflower but do not core it. Cut the cauliflower into florets and stalks, and transfer them to a large rimmed baking sheet. Peel and cut the carrots into 2-inch pieces. Cut the thinner pieces half down the length; cut the larger, thicker pieces into quarters. Peel and cut the onion in half and slice 1/4-inch thick. 4 Cook the vegetables: Heat the oven to 425°F. Combine the cauliflower, onions, carrots, and lemon slices on a sheet pan. Add dabs of the remaining harissa mixture here and there over the vegetables. Sprinkle evenly with 1/2 teaspoon of salt. Add the water to the edge of the pan. Cover the pan with foil and cook the vegetables and the sliced lemons for 20 minutes. Remove and toss gently. Continue cooking for about 15 minutes, uncovered, or until the vegetables are almost tender when pierced with a skewer. Remove from the oven and turn again gently. 5 Cook the chicken and vegetables: Increase the oven temperature to 450°F. Set the chicken, skin side up, on the vegetables. Sprinkle evenly with 1/2 teaspoon of salt. Continue cooking, uncovered, for 25 to 30 minutes, until the chicken is cooked through (breasts will register 160°F on a meat thermometer; legs and thighs 180°F). The vegetables will be very tender and are meant to be served quite soft. 6 Serve: Remove from the oven, sprinkle with cilantro, and serve with rice or spaghetti. Hello! All photos and content are copyright protected. Please do not use our photos without prior written permission. If you wish to republish this recipe, please rewrite the recipe in your own unique words and link back to Sheet-Pan Harissa Chicken with Carrots and Cauliflower on Simply Recipes. Thank you! This was great and easy for me to adapt. I used boneless skinless thighs and followed Suzy recommendation of no steaming and the roasting times she did. It worked perfect for the chicken thighs and the cooking time is shorter. The family loved it. Wow, this was so good! I’ve made the full recipe once, but have done just the cauliflower a few times for lunch or as a side dish for dinner. The blackened bits are the best. Thanks for a winner! Oh, boy, we liked this. Since I truly dislike scrubbing, I always line my pan with foil. We prefer our veggies a little firmer, so I skipped the steaming part, and went right to a 20-min roast. Added the chicken, bumped up the temp, and roasted another 25 min. While the skin wasn’t crispy, it tasted fabulous, so good that we agreed to skip the rice for next time. Can you advise on a homemade version of the harissa? I liked this recipe but since I think I have all the spices already it’s more economical to make it myself. Hi, Michelle! Here’s a recipe for harissa paste, and another for the dry spice mix. Enjoy! 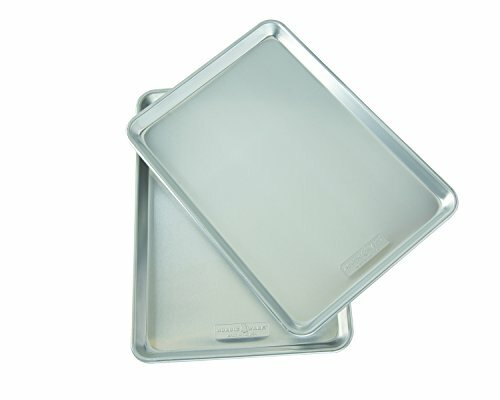 Can I use a roasting pan with a lid instead of aluminum foil, or does that change the effect? Hi, Jessica! Yes, I think that would work just fine. Enjoy!